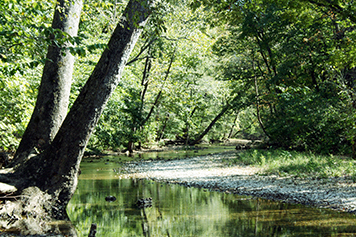 The Branson-area Ozarks are a great place to get outdoors and explore. The Branson-area Ozarks are a great place to get outdoors and explore, and with hundreds of miles of hiking, biking and horseback trails, you have lots of opportunities to get up-close with the beauty of nature! Go five miles east of Branson on Highway 76, then six miles south on Route J, and 0.75 mile on County Road J40. West side of Branson on Highway 76, 0.75 mile west of the Highway 376/Highway 76 intersection. On the north end of the Conservation Area, travel east on Highway 248, 0.25 mile from the intersection of Highway 465/Highway 248. Turn right on Sycamore Log Church Road and go south 3.4 miles to a gravel parking lot adjacent to Roark Creek.